Parker can't understand how Millie has retained her idealism in a place like D.C. Millie can't believe what Parker's willing to sacrifice in order to pass a budget. But as they navigate their political differences, what grows between them looks a lot like a relationship... and maybe even a little like love. For various reasons, I don't often go for ARCs (in fact, this is my only one so far this year). 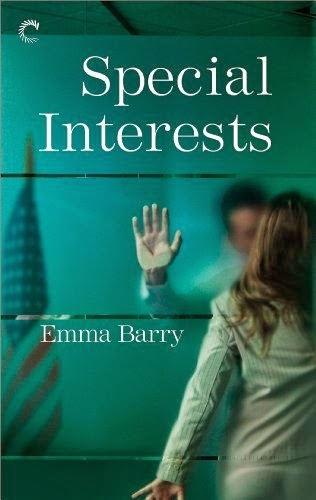 However, I saw Emma Barry's tweet offering review copies of her upcoming contemporary polical romance when I was in just the right mood for it. I contacted her and immediately started reading the book. Special Interests is a romance between two people who, although ultimately on the same side, have very real political differences. I really liked that the politics here seem to be more grounded in reality than I'm used to in romance novels. I understand why authors might prefer to not make their politician characters' party affiliation explicit, but that's a fiction that stretches credulity more and more. A principled politician in one of the big US parties would not believe the same things as one in the other party. Here, both characters are Democrats, but that doesn't mean that this won't be the source of some really fascinating conflict in their relationship. Millie works as a labour organiser. She has a job with a union, and truly believes in the cause of defending workers' rights. It's frustrating work, because it feels like they've lately been perpetually on the losing side, but she feels good about doing it. Parker works as a senior staffer for the Senate majority leader. Millie's union are one of their core consituencies, but in Parker's view, his job is closing deals: making sure the next budget passes, keeping the government from coming to a standstill. And that might mean giving up things that are very important to Millie and her union. The Washington DC in this novel is a vivid setting, and I liked that this is a novel peopled by characters who actually care and talk about politics and the nitty-gritty of budget negotiations and such. I mean, the external conflict is: will Parker manage to do a deal on the budget and what will it take! I'm not sure if it would be everyone's cup of tea, but as a government economist working very closely with the policy delivery function, it was definitely mine! My government economist job not being for the American government, I can't know how accurately this shows what actually goes on, but it feels like a real world. There's internal coherence, and FWIW, from what I read about current American politics, it rings true. I particularly liked the subtlety of the portrayal of the characters' different positions. The author's take on Parker and Millie's very different approaches was interesting and thought-provoking. Parker is focused on outcomes, on getting the deal now, and therefore feels everything has to be negotiable. Millie, on the other hand, feels that this is treating important things like a game, when they should be taken seriously. I feared Barry might overly bash Parker's position, but she didn't. They have some spirited discussions and both get in some zingers (including Parker's accusation that it's very easy to feel superior by holding onself above the system and not engaging). There is no big conclusion, no easy answer, and acknowledgement that Millie's and Parker's roles are important and necessary. It's great. Heck, even the Republicans are subtly portrayed, and we all know how easy it is to make them into ridiculous figures. They're not portrayed as evil, but as firm believers in things that our protagonists disagree with. They're just refusing to play the game of compromising for the sake of keeping the country working, and this is a source of much frustration both for Parker and for his counterpart on the Republican side. There's a scene when these two characters make an unexpected connection, and that and what develops from it were some of my favourite sections in the book. So, what about the romance? Well, at the core of it, this is a very traditional relationship arc. Millie and Parker meet and start dating and the relationship proceeds from there, basically. As I mentioned, when it comes to reconciling their political differences, the novel is great. The rest of the development is less great, definitely not as good as the rest of the book. Millie and Parker's relationship is very sweet, but I did have a niggling feeling that it was all a bit too fast. Parker goes from cynical guy who has no time or interest in relationships to someone totally up for falling in love and going to brunch on a Sunday with his new girlfriend, and this happens awfully quickly and without that much angsting about it. Parker's mental monologue is more about how to make Millie and the people around him see that he's not that guy any longer than about whether he's ready to change and stop being that guy and just go for it. And then there is Millie, who is just not sure about Parker and whether someone like him is the right guy for her. I kind of got what was worrying her, but in the second half of the book it sometimes feels as if we're going round in neverending circles and I lost track of what she was on about. So, not perfect, but I enjoyed this very much, and will definitely keep an eye out for more books by this author.